Today’s post is about Search Engine Optimization (SEO) for small business. Essentially, it’s the practice of improving your results ranking on sites like Google.com. This week, I read a great post from my friend Phil Faranda regarding an SEO company masquerading as a lead in order to get his attention. Phil, like anyone, was aggravated by this tactic – as he should be. He mentions that an SEO company’s job is to be found, so it’s ironic that they would need to use such a questionable tactic. With the somewhat recent release of Panda, Google’s intent is to rid your Search Engine Results Pages (SERPs) of bogus, stolen, or concocted content created by content farms. In short, they are trying to make their already successful product better. I don’t want to bore you with the details of the release. If you really want to learn more about it you can go here or here. For now, I am focusing on the business of SEO. The big takeaways here are that not only has Google taken the legs out from under a number of questionable web practices (a good thing), but has also made it much more difficult for ANYONE to game their algorithm (an even better thing). You see, these tactics don’t help one’s user experience AT ALL. All it does is give you results in your SERPs that are not what you are looking for, thereby making your job as a user more difficult. There, enough of that. What are the repercussions in the industry though? Well, to Phil’s allusion earlier, life has gotten harder on SEO companies as of late. Anyone who has a website with a contact page on it has gotten one of the emails he complained about. If an SEO company was that good, they wouldn’t have to resort to these dastardly tactics. In fact, if they are really bringing the value they say they do, their organic search traffic should get them more leads than they could handle. Before anyone gets insulted, I think there is still room for content strategy firms to provide services to small and large businesses – don’t misunderstand me. There will always be good ones out there. I’m really criticizing those bush league firms that use these sneaky tactics which Panda is looking to close the door on – the fakers, the gamers, and to some extent, the e-commerce sites. The thing to remember here is that the companies that are going to continue to do it are going to do it strictly based on Google’s terms. There will be no more gaming. They will do it with…….wait for it……..genuinely good and relevant content – so everyone wins. Amazing concept. The silver lining for small businesses that can’t afford a large SEO firm that costs tens of thousands of dollars is you can do this yourself. Perhaps you can’t do it as well as a top notch SEO firm; however, they are being employed by much larger firms who I would hope you are not thinking of competing with. If you sell hamburgers in Gramercy Park in New York City, your competition is not McDonald’s. Your competition is the pizza place, the Chinese restaurant, and other burger joints in the vicinity. Also, other eateries over on the Upper West Side aren’t your competition. You are local and you are specific. None of them are employing any of these agencies either. The great thing is that none of these things are rocket science but, if you aren’t willing to do them you may want to consider hiring someone that knows this stuff. It’s not hard but it does take time ( = money) and you have to stay on top of it. The local businesses that I see doing a great job of SEO are those that practice the above tactics and have been able to garner a following due to bringing value to their industry/community plus having the support of others (in reciprocity for the support they give). These companies, in some instances, can compete with much larger companies. It takes time and effort but, in my opinion, nothing beats local business. They have inherent advantage over chains/franchises that can’t be overcome. The local coffee shop shouldn’t fear Starbucks. Their real customers are not going to leave for them. They have different offerings. Starbucks cannot and will never be able to offer something genuine to the community. They are there to deliver a specific product to as many customers as possible while maintaining the highest margins possible. There are no special orders. They don’t know about the people in the community nor do they care. They are not going to be at your local Chamber of Commerce meetings. And, the barista at your local Starbucks will never have a website/blog about how Starbucks is important to the neighborhood because he/she will probably not be working at Starbucks next year. The fact that no one can predict with any degree of accuracy what will happen to SEO does not mean that you should not keep up with the trends, and social bookmarking sites are valuable tools for sites and online marketers. I think that striving to be at the top of page one of google is admirable if it’s a good fit for your business however it is becoming harder and harder to do that without great content. The lines between “good for bots” and “good for humans” is blurring. Social search is definitely playing a factor in that. 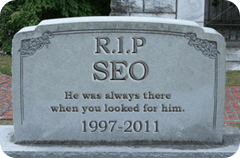 You may be familiar with the declare, that SEO will die very soon. That Search engines is modifying the methods so much, that the articles seo does not perform any longer. That the visitors goes to the individuals away from the applications. And we SEOs will be dead. I am seeing more and more companies adopt a home grown content approach to organic placement. I don’t think the ability to mechanize these things will be around much longer. The next update to the algorithm may be the final nail in the coffin. I think smart SEO companies are re-positioning themselves as content advisers and developers.